When changing a logo or brand image, it is important that the new image is portrayed visually. This can be done in the form of enamel badges, stick pins and Keyrings, ensuring the new logo is at the forefront. When changing your company logo or brand it is important to get the message out there in a visual way. 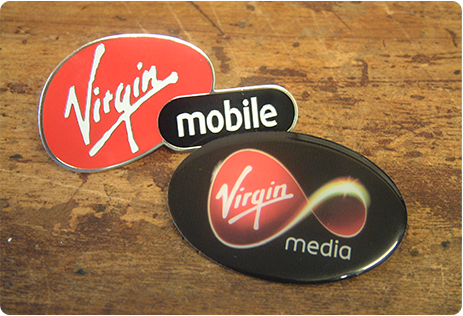 This is exactly what Virgin Media did when changing from Virgin Mobile to Virgin Media. Virgin Media sponsored the British Superbike Championship and wanted a badge for their Virgin Media Pit Police Girls to wear, getting the new logo seen by the general public and press. The badges were a great way of doing this and were place on the peak of the police style hats they had made.